Golden Triangle with Rajasthan Tour is the most opted Rajasthan tour. The destinations selected in Golden Triangle with Rajasthan Tour represent, along with Delhi & Agra, various sub-regions of Rajasthan, characterized by their distinctive styles of art, architecture, dialects, history and cultural nuances. As Golden Triangle with Rajasthan Tour covers and showcases major cultural centres of Rajasthan, tourists prefer it the most. Welcome to incredible India. You will be received by our representative with best of traditional Indian hospitality at Indira Gandhi International Airport, New Delhi. You will be transferred to New Delhi hotel. Our representative will ensure smooth check in at the hotel. As most of the international flights land in New Delhi during mid-night, so, after check in at the hotel, have sound sleep in New Delhi hotel to get relaxed for the sightseeing tour of Delhi next day. Political and cultural capital of India, Delhi offers a tourist lot of experiences. It includes great ancient monuments with modern cosmopolitan infrastructure, old bazaars with big arcades and malls, narrow alleys with wide modern roads, traditional lifestyles with modern day hectic pace of activities, sheer luxury with wretched poverty etc. Have delicious breakfast in New Delhi hotel and move for Delhi sightseeing tour along with Government certified Delhi tour guide. The sightseeing of Delhi will comprise Red Fort, Jama Masjid, Chandni Chowk (while enjoying manual rickshaw ride), Akshardham Temple, India Gate, Rashtrapati Bhavan, Qutub Minar, Sansad Bhavan, Lotus Temple, Humayun's Tomb & Laxmi Narayan Temple. During the course of sightseeing explore culture, market & taste of Delhi. After full day sightseeing of Delhi, both old and new, return to New Delhi hotel for overnight stay. Rise up early in the morning, have breakfast in New Delhi hotel and proceed for Agra, a historical city with three historical sites included in UNESCO World Heritage sites. On arrival at Agra, you will be received by Agra representative and introduced with Agra tour guide. As you will directly be transferred to Agra hotel, our representative will ensure your smooth check in. Having relaxed for a while, along with Agra tour guide, proceed to visit famous monuments of Agra which include Taj Mahal, Agra Fort and Tomb of It-Mad-ud-Daula (Baby Taj). Thereafter, explore colourful local market of Agra. Later in the evening return to Agra hotel for overnight stay. After visiting Abhaneri village, move for Jaipur. On arrival at Jaipur, our representative will receive you and transfer you to Jaipur hotel. Our representative will ensure smooth check in at the pre-booked Jaipur hotel. Have relaxed overnight stay in Jaipur hotel. Wake up early in the morning, have breakfast at Jaipur hotel and proceed on for Jaipur city tour. 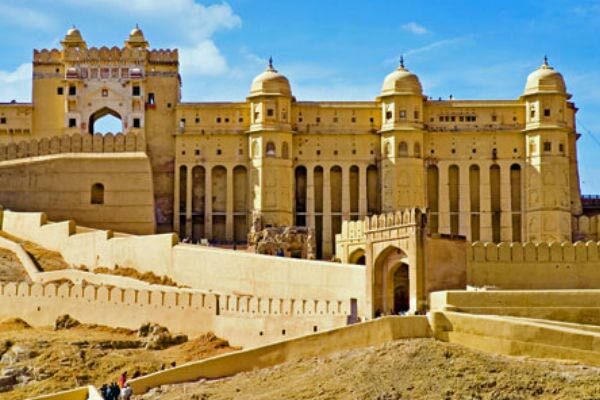 Take an excursion to Amber Fort. Enjoy a ride on caparisoned elephant from foothill to the gate of Amber Fort at the hilltop. After visiting Amber Fort, drive for the Jaipur city tour which includes prominent monuments like Jantar Mantar, Hawa Mahal and City Palace. After visiting these monuments, explore local market of Jaipur. Late afternoon, you will be taken to Birla Temple to attend evening 'aarti'. After watching royal monuments, bustling market and auspicious 'aarti', return to Jaipur hotel for overnight stay. Having breakfast in Jaipur hotel, proceed to Pushkar in the state of Rajasthan India. On arrival at Pushkar, you will be received by our representative and given transfer into Pushkar hotel. Relax, refresh and proceed for Pushkar sightseeing which comprises Brahma Temple, Pushkar Lake, colorful local market and unique lifestyle in a Hindu pilgrimage. Pushkar tour guide will be introduced with you in Pushkar hotel. Having explored Pushkar in leisurely manner, return to Pushkar hotel for overnight stay. Having delicious breakfast in the hotel, depart from Pushkar to Udaipur. On the way to Udaipur, have a halt at Chittorgarh to have lunch and visit Rajasthan's most respected and historical fort-palace and temple complex at Chittorgarh. Though in a dilapidated state, glorious past peeps out the remaining monuments. Chittaur Fort is more famous for its antiquity dating back to Mauryan Empire and three "johars' when women and children sacrificed themselves on a huge funeral pyre. 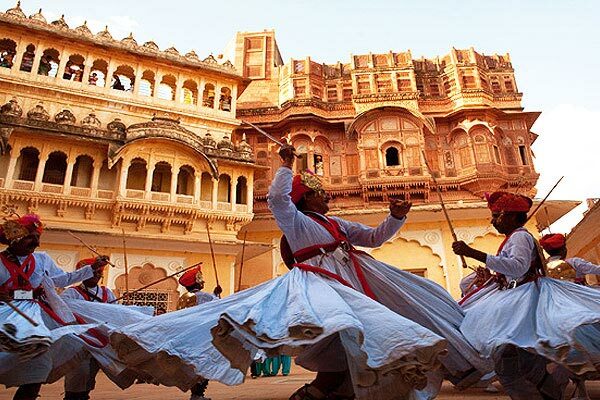 Golden Triangle with Rajasthan Tour will take you today the 'Blue City of Rajasthan'- Jodhpur. Having taken delicious breakfast, check out from Udaipur hotel and proceed for Jodhpur. On the way to Jodhpur, stop at Ranakpur, a renowned Jain pilgrimage. Ranakpur is one of the most famous Jain temple towns of Rajasthan, India. Visit Ranakpur temple, located in pleasant idyllic set up. Built of light coloured marble, Ranakpur temple of the Jain is constructed in 'chaumukha' style on an area of 60X62 metres with more than 1444 exquisitely carved marble pillars. 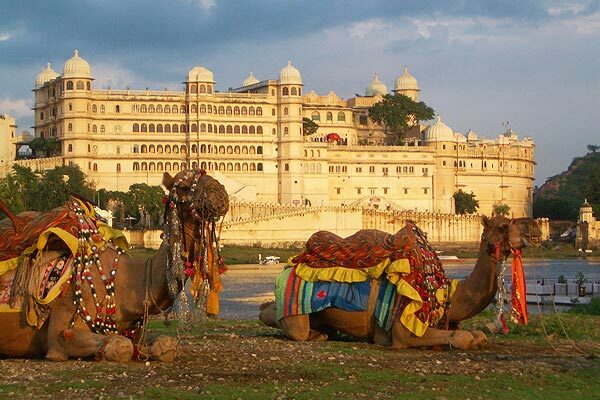 Golden Triangle with Rajasthan Tour , you will be taken to craftsmen villages of Bishnoi tribe. Having enjoyed delicious breakfast in Jodhpur hotel, move on an excursion to Bishnoi village to have a look of real rural life in a Rajasthani village and villagers' skill sets and value systems. Enjoy mingling with rural folks, participate in religious rituals & experience real Rajasthan. The Bishnois, a non-violent and nature loving sect of Hindu religion, are known for their harmonious co-existence with the nature and the animals. The Bishnoi community is known for its craftsmanship. The next stoppage on your Golden Triangle with Rajasthan Tour is Jaisalmer. Having taken succulent breakfast in Jodhpur hotel, depart for Jaisalmer, the 'Golden City of Rajasthan'. Our representative will receive you on arrival at Jodhpur and ensure your smooth check in at pre-booked Jodhpur hotel. Relax a bit and have lunch in Jaisalmer restaurant. Hereinafter, move on a half day leisurely sightseeing tour of havelis of Jaisalmer. The half-day sightseeing tour of Jaisalmer will include prominent havelis like Nathmalji-ki-Haveli & Patwon -ki-Haveli along with Manak Chowk. Manak Chowk is the main marketplace outside the fort leads to the narrow lanes dotted with famous havelis. After enjoying relaxed but vivid sightseeing of Jaisalmer, return to Jaisalmer hotel for overnight stay. After having delicious breakfast in Jaisalmer hotel, move on for visiting Jaisalmer Fort, popularly known as "Sonar Qila (Golden Fort)". The Jaisalmer Fort is a live fort with a whole city built inside and being inhabited by local people. Built of golden sandstone in 12th century on Trikuta hill, Jaisalmer Fort is fortified with 30 ft high walls with 99 bastions. 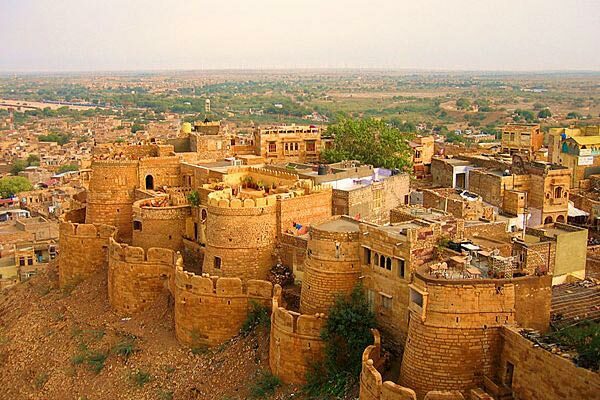 Jaisalmer Fort is home to several archaeological and historical masterpieces like Hindu and Jain Temples, palaces, havelis, mansions, libraries etc. Jaisalmer Fort has been regarded as one of the most magnificent and invincible forts in Rajasthan. After lunch, in afternoon, excursion to Sam dunes will take place. The excursion will be a camel ride/ safari in the sand dunes of Thar Desert. The camel safari, night-stay in tented accommodation in Thar Desert and dinner on sand dunes while folk dance and music being performed will be incredible aspects of real Rajasthan. Explore and enjoy desert traditions, folk culture and desert ways during your Jaisalmer camel safari. Overnight stay in Jaisalmer tent/hut. The distance between Jaisalmer and Bikaner is the longest stretch between two destinations in Golden Triangle with Rajasthan Tour itinerary. As a significant chunk of day will get consumed in travelling, you are required to move from Jaisalmer at the earliest so that you have enough time to visit maximum number of monuments in Bikaner. Have breakfast in tent in Jaisalmer and proceed for Bikaner. You will be received by our representative on arrival in Bikaner and transferred to Bikaner hotel. Many a times, when a visitor finds oneself too tired to visit all the monuments of Bikaner at the time of arrival, he visits the leftovers today in Bikaner and then departs for Mandawa, after taking sumptuous breakfast in Bikaner hotel. It takes approximately four hours to reach Mandawa, a village town in Jhunjhunu district of Rajasthan. On arrival at Mandawa, our representative will assist you check in at Mandawa hotel. Mandawa tour guide will be introduced with you in the hotel lobby. After relaxing a bit move out to visit Mandawa, known as 'open Art Gallery' due to large number of mansions (havelis) beautified by fresco paintings depicting mythological and historical themes. Famous havelis are Gulab Bai Wadia Haveli, Ganeriwala Haveli, Jhunjhunwala Haveli, Kanoria Haveli, Goenka Haveli, Nandlal Murmuriya Haveli, Thakurji Dedraj Tarmal Haveli, Ladiya Haveli, Neowatia Haveli, Laduram Haveli and Chokhani Haveli. You have ample time to for exploration of culture, handicrafts market & rural lifestyle. After exploring Mandawa, in time return back to the hotel for overnight stay in Mandawa.